You have to give Malibu credit for trying new things with the Ultraverse. The Firearm movie is probably the best example. 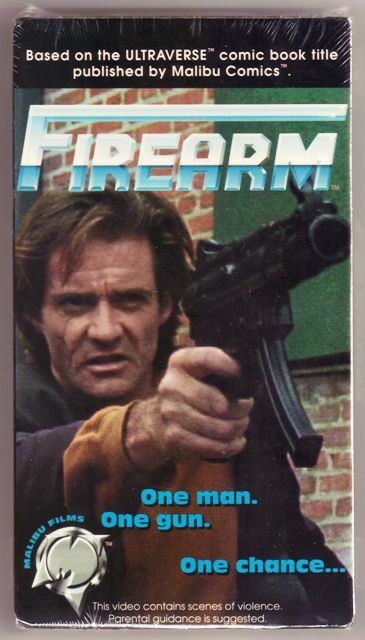 The deal here is the story in Firearm 0 is continued from the movie, which was 35 minutes long … a live-action film. 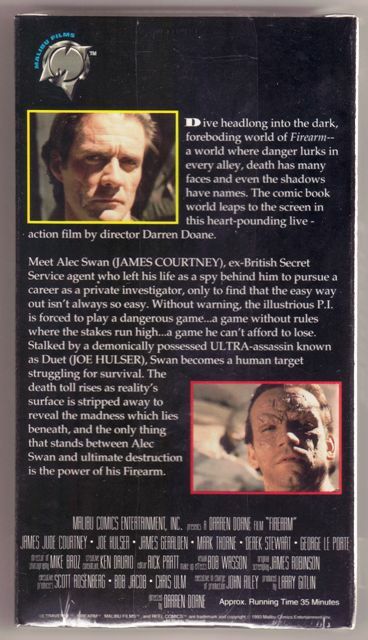 I wanted to watch this again to brush up on the story but to be honest I don’t have a VHS player any more. I guess that makes me like most people. I don’t think anyone won Oscars for their work here but it was an interesting concept. Darren Doane was the director; IMDB has him down for 16 directing credits, mostly music videos or music related. James Jude Courtney played Alec Swan. He has 21 acting credits but hasn’t worked since playing “Huge Goon” in 2002’s The Gray In Between. He was Der Kindestod on Season 2 of Buffy the Vampire Slayer, although I can’t tell you if that is impressive or not. 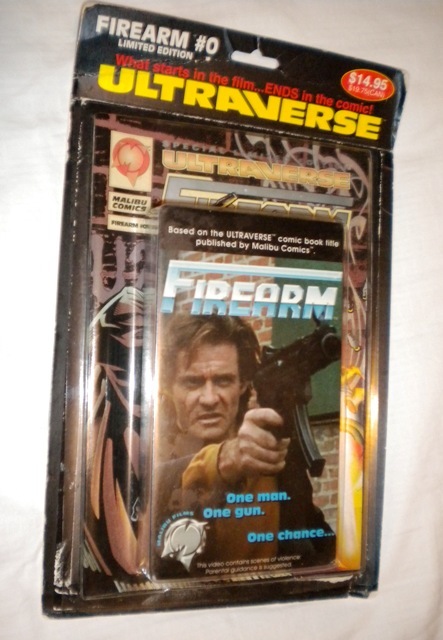 The comic and the movie were packaged together for a cover price of $15. Not a bad price point considering what you got. Reported distribution numbers were 30,000, according to the Collectors Guide to the Ultraverse. There was also a signed and numbered edition (2,000 of them), although these just came from the regular print run. This is pretty easy to find online, even in the original packaging. Finding one in packaging that still looks pretty nice can be difficult, though. Most of the ones I have seen are pretty frayed and bent. But I would happily pay $15 or so for one that looks to be in really good shape. This entry was posted on Wednesday, June 8th, 2011 at 1:14 am	and tagged with Darren Doane, Firearm, James Jude Courtney, VHS and posted in Other stuff. You can follow any responses to this entry through the RSS 2.0 feed. The videotapes were also different colors. I’ve got a gold one, and I’ve seen red. I have never even heard of this. Being in the UK, we can’t get hold of it. Anyone know anywhere we can watch it online? 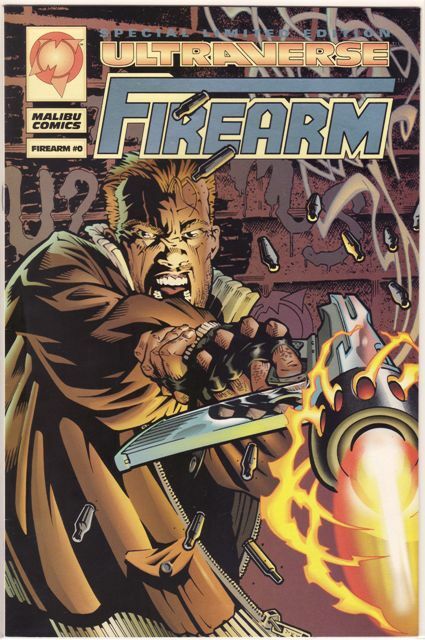 Hi Friend, my name is Umberto,I’m a fan of Ultraverse (my favorites are Firearm and Freex) I write from Rome and wanted to ask if you can get me a copy of the film on DVD-r, I can not find it anywhere!